ARMAK Geared Piston Air Motors are in production in 2 to 16 kW versions. 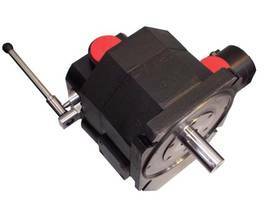 The torque is developed by one rotating piston and is transferred to the output shaft by a synchronising gear train. On this output shaft is mounted the sealing rotor. Both components are rotating without physical contact and with an extremely small air gap for high motor efficiency.This frictionless operation results in long maintenance free operation without downtime. The totally closed motor housing without breather holes permits applications in wet or dirty surroundings without danger of corrosion in the motor. ARMAK Geared Piston Air Motors are the ideal drive system for all arduous, difficult and long life applications, in particular when combined with the new ARMAK control valves. The new technology, reduced operating costs and better performance are arguments in favour of ARMAK Motors - besides a short delivery time. Mandatory field Security Question against spam* What is the sum of 5 and 1? What is the sum of 5 and 1?